Every day at 6 a.m. thousands of citizens invade the street of Yaoundé. As well as work, many are there for sporting activities such as running. They make evident the hundreds of formal and informal associations devoted to sports, and health. Yaoundé is a city of enclaves and inequality, which is reflected in these weekend sports. In my three main fieldsites, Mvog-Ada, Quartier Fouda and Mfandena, the distribution of sports infrastructures illustrate the gap between the citizens’ commitment to sport and the lack of public facilities to support those efforts. The Ministry of Youth and Sports, promote sport as a condition of a healthy life, as against smoking and drinking. Despite which there is a lack of public infrastructure to support sports initiatives. In Mvog-Ada there is basically no place for running or even walking on the narrow streets. 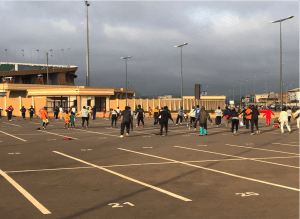 Sports groups have to cross the city to find a stadium or free space for running such as the University of Yaoundé 1 campus, and the Omnisport stadium which is being prepared for the 2019 African football nations cup. One striking feature in Yaoundé is womens’ commitment to sports. While a decade ago an informant noted that women rarely participated in sport, today they dominate. As one of my informants (a 45-year-old teacher), underlined, you would rarely find women involved in those groups. Nowadays, the groups are dominated by women. In the “famille santé club” among the 70 registered members, 55 are women.